14ymedio, Marcelo Hernandez, Havana, 6 January 2019 — Red hats with a white band, beards as props, and gifts placed under the tree are Christmas elements increasingly frequent in Cuban homes. 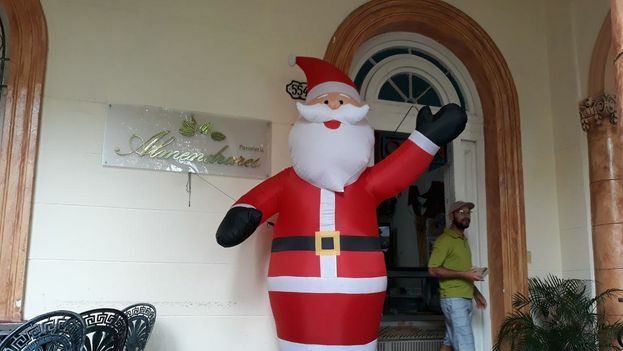 The increasingly fluid contact with Cubans in exile, after the immigration reform of 2013, has reduced the tradition of the Magi, while Santa Claus is more present on the island. Suany del Valle, 45, recalls that when she was a child in the 80s, the celebration of Three Kings Day on January 6 and any mention of Melchior, Gaspar and Balthasar was frowned upon by the ruling party. “My grandmother and my mother kept the tradition in whispers,” she tells 14ymedio. “But now that it is allowed, many people prefer to deliver the gifts on the night of December 24,” she laments. Del Valle was one of the girls who bought toys through a rationed distribution mechanism that was invented during the years when Fidel Castro ruled and the Soviet subsidy was a major source of support for the island. “They moved the sale of toys to July* to erase any closeness to the Magi and you had to stand in long lines to get a doll,” recalls this Havana graduate in economics. Now, toys, sweets and even children’s clothing can only be purchased in stores in convertible pesos under the law of supply and demand. “That has meant a new social division, between children who only receive chocolates or sweets these days and others who get remote control cars or Nintendo,” says Del Valle. On the black market, the offers focus on children’s gifts to be delivered around Christmas Eve. “We sold most of the toys in the days before December 24, some parents wanted to keep them for the Magi, but most wanted to deliver them on Christmas Eve,” says 28-year-old Geovanny Lopez, an informal merchant. “I traveled to Panama at the beginning of December with a list of customer orders. They were mainly looking for accessories and costumes related to Santa Claus, plastic trees, lights, balls and garlands to decorate, as well as children’s toys,” he tells this daily. “Most buyers told me that they needed gifts for Christmas,” says López. The trend is confirmed by Miguel Godínez, 54, who lives in Tampa. “I sent some 300 dollars to my family to celebrate the end of the year and to buy Christmas Eve gifts.” The emigrant is one of the many Cubans living in the United States who is helping to mold a new tradition, to the detriment of the Three Kings. Cubans in the United States are the largest Cuban community outside the island. In 2013, the United States Census Office estimated the number of Cubans living in the United States at 2 million, counting those born there of Cuban parents. Their influence in the lives of their relatives left in Cuba has been growing, to the extent that the sending of remittances and trips to and from both sides of the Straits of Florida have also done so. Cuban-Americans have been an outpost of Santa Claus, who in Cuba is not called by his other names: Father Christmas or Saint Nicolas. On the island there is a silent battle between the old traditions inherited from Spain and the American ways. Private businesses contribute to reinforcing the latter by preferring the decorations or motifs in which the plump gentleman dressed in red is seen. In the midst of the liquidity crisis that Cuba is experiencing which affects the import of merchandise, not only are there no drugs or flour for bread, but the deficit also reaches the products destined for children. Maria Ysabel Travieso recounted in her Facebook account that she visited the toy department in the Centrally Located Plaza de Carlos III on January 3 and found all the shelves empty. “What emotion, we went looking for the toys for the Three Kings…,” she wrote on her wall on that social network; her publication was shared more than a hundred times and generated dozens of comments. The actor Luis Silva, who plays the popular humorous character of Pánfilo, was one of those who asked Travieso about the place she had gone to buy and shared her images on his own wall. However, it is not only the shortages and the American influence that have contributed to a cut in the celebrations of January 6. Despite the permissiveness of recent years, the Plaza of the Revolution has continued to look on the the festivity with ill-will and often the most orthodox voices of the ruling class criticize the “consumerism” that the date generates. Abel Prieto, former Minister of Culture, recently posted on his Twitter account that “the commercial use of Christmas is deeply anti-Christian.” The official has been at the head of the government’s attack against the influence of American traditions on the island and other “imported” events such as certain musical genres, Hollywood movies or video games with major action. In 2001, the Magi became the center of a bitter diplomatic dispute between Havana and Madrid. The Cuban press attacked the Spanish embassy in Havana for having organized a procession with Melchior, Gaspar and Balthasar in an area close to the Spanish embassy and the Havana Malecon. The caravan, in cars pulled by horses, threw caramels in its wake. *Translator’s note: Fidel Castro used the excuse of needing the entire nation to focus on the sugar harvest as a reason to “reschedule gift-giving” to the summer.